Nearly 1,400 aftershocks have been measured since Friday’s 7.0 earthquake in Alaska – Coercion Code – "Dark Times are upon us"
Earthquakes associated with Friday’s 7.0 earthquake north of Anchorage as of 5:45 p.m. Sunday. The red dots represent shakes in the previous 24 hours, and the yellow dots are from the past week (with virtually all of them since Friday. The large dot directly north of the city was Friday’s quake) Map from Alaska Earthquake Center. Dozens of small earthquakes rattled Anchorage and Mat-Su on Sunday night and early Monday — and a few bigger ones probably caused unwanted wake-ups. Twin magnitude 3.5 shakers struck at 9:51 and 9:52 p.m. Sunday, the first 10 miles north of Anchorage and the second 18 miles northwest of Joint Base Elmendorf-Richardson, according to the U.S. Geological Survey Earthquake Science Center. A magnitude 3.4 quake was measured 10 miles northwest of Anchorage at 10:40 p.m. A 3.5 hit at 1:30 a.m., 17 miles northwest of JBER, followed by a magnitude 3.8 just before 3:20 a.m. 13 miles northwest of JBER. Twin 3.2 quakes followed just before 6 a.m., one near Anchorage and the other near Wasilla. Aftershocks from Friday’s magnitude 7.0 quake will continue to diminish over time, but that doesn’t mean the shaking will stop right away. As of Sunday evening, there had been nearly 1,400 recorded aftershocks of any magnitude; 593 of magnitude 2.0 or greater; 17 that registered at least 4.0; and five that were at least 5.0. 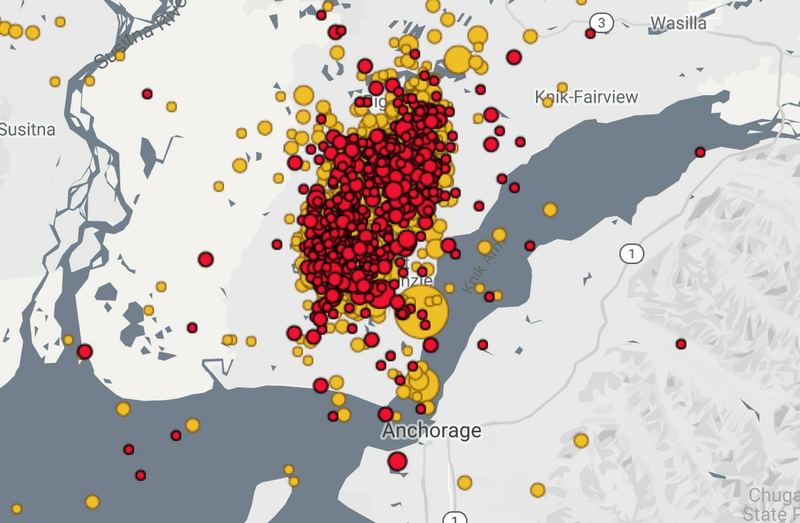 All the aftershocks have been clustered around the epicenter across Knik Arm from Anchorage. Abreu said models show the frequency, and strength, of the quakes should go down over time. Here’s a ground motion visualization for the first hour after the earthquake. You’ll see 7 major aftershocks (notated) along with many smaller ones that only show up on the stations near the epicenter. Although devastating, large earthquakes give scientists a wealth of data to help study and better model future earthquakes. “It gives us a better understanding of what is happening from a geologic point of view,” he said. 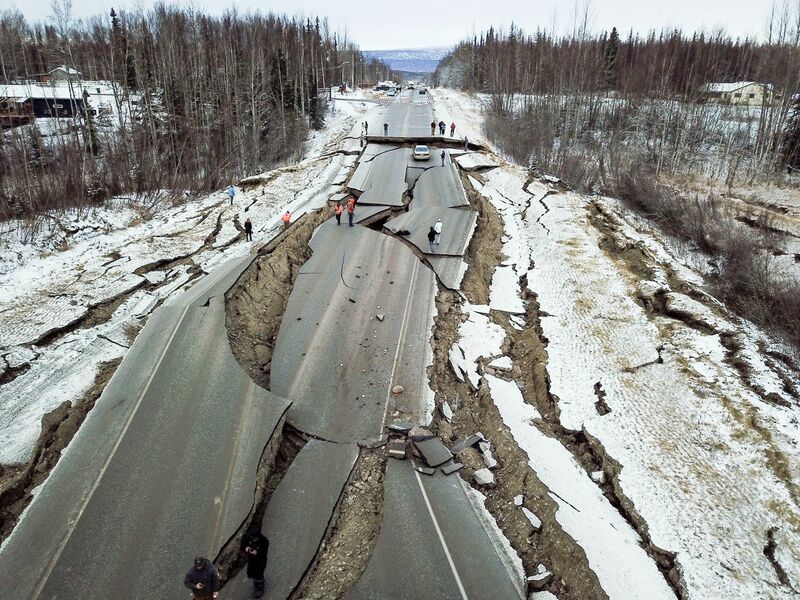 While Friday’s quake was a big one, Abreu said it wasn’t unusual in that Southcentral Alaska is one of the world’s most seismically active areas. “We’re definitely not surprised to see an event of this magnitude happen in this area,” he said.